Four woman on a perilous voyage to a new world can rely only on their wits – and each other.Friday Woolfe, is in London’s notorious Newgate gaol, awaiting transportation. There, she meets three other girls: intelligent and opportunistic thief, Sarah Morgan, naive young Rachel Winter, and reliable and capable seamstress, Harriet Clarke. On the voyage to New South Wales their friendship becomes an unbreakable bond. This is the story of four convict women beginning in the late 1820s. They meet in Newgate Gaol and are transported to New South Wales together. They form a strong friendship and look out for each other in gaol, on the voyage and on their arrival in the colony. The descriptions of the harsh conditions in the gaol and onboard the ship to New South Wales are very vivid. The women also spend some time in the Parramatta Female Factory and it was interesting to read about something that was so close to the library. I enjoyed reading this book and was pleased to see there is a sequel called Girl of Shadows, so I can see what happens next to the women. 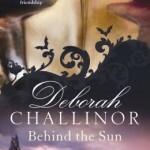 This entry was posted in Australian Authors, Fiction, Recommended Reading and tagged Behind the Sun, book review, books, Deborah Challinor, reading, Staff Pick by admin. Bookmark the permalink.